Today we began our homeward journey. Leaving the Grand Hotel Bonanno with our luggage and the breakfast bags provided by the hotel, we drove the 1 1/2 miles to the airport in Pisa. The rental car was turned in to Hertz, and we prepared for check-in with Vueling Airlines. At $110 per person per ticket, Vueling Airlines was a most inexpensive way to travel to Barcelona. 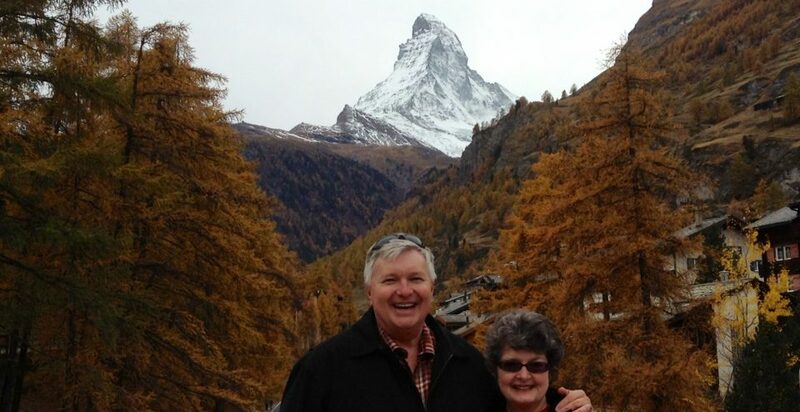 Wayne & I were used to economical travel requirements and breezed through the check-in process. Unfortunately for Paula, she and I misunderstood the weight limits for travel on Vueling Airlines. Even though Wayne had warned us, reading the rules to mean that a 23 kilogram limit existed for the total weight limit of checked bags, Paula and I mistakenly interpreted the reading of the requirements to mean 23 kilograms per checked bag. Wayne had been right! We tried to juggle the luggage to redistribute to the lowest weight possible, but–alas–Paula’s extra luggage weight cost an additional €300 euros in order for her bags to be placed on board. Paula was a very unhappy passenger. We went to the ticket office, and I tried to get a credit or refund for the additional luggage for which I had pre-paid for Paula. Unfortunately, that was not possible. Paula had to pay the additional penalty for overweight luggage in order to get a boarding pass. We went through security with little hassle, although Ken did have deodorant and lotion confiscated. We settled down for a lengthy wait as air traffic in Barcelona was causing a delay of our flight. All went well with our flight and arrival in Barcelona. We caught a shuttle to the TRYP Barcelona Aeropuerto where Paula had made reservations. After some confusion with the check-in, we got settled in our rooms and ate a late lunch in the hotel restaurant. After a short rest in our rooms, we took off by bus (€2 per person) to visit Barcelona, the capital city of Catalonia and the second largest city in Spain after Madrid. We walked along the pedestrian street of Las Ramblas that begins at Plaza Catalunya. While eating paella and drinking sangria at an outdoor cafe, we encountered a boisterous, but police-escorted, protest drawing attention to widespread displeasure in Spain with the economy and the banking industry. After stopping at our familiar El Cortes Ingles supermarket to buy Valor A La Taza Chocolate to bring home, we returned to the hotel by bus to prepare for our return trip tomorrow to the United States. Sleeping in the privacy of our perch high above the Mediterranean with open windows that embraced the glorious nature outside, we awoke early with the sun and the morning rooster that greeted the day. We were eager to return to the Cinque Terre, the series of five pastel-colored villages that cling to a remote, rugged stretch of the Italian Riviera coastline. Each town is undisturbed by traffic or modern development and has been declared a national park by the Italian government. The towns of the Cinque Terre, from right to left, are Riomaggiore, Manarola, Corniglia, Vernazza, and Monterosso al Mare. Earlier this year, we walked the streets and climbed the stairways of each little village with our traveling companions, Randy & Melisa Standly. Today, we chose to provide for Ken & Paula just a flavor of the enticing character of this picturesque region of Italy. Our lodging at Hotel Europa at €130 per night was more than spectacular. The breakfast spread was regally presented with linen, silver, and crystal and included the finest of tasty, nutritious foods just as we have been blessed to enjoy on our journey. The view from the dining room was enchanting. Overlooking the Mediterranean replete with sailboats and fishermen’s regalia bobbing in the water, mountains rising up high from the waterfront, dotted with homes peeking out from the forested mountains that rise up above the waters, the outdoor balcony provided an incomparable breakfast setting. After eating breakfast, we left our luggage locked up at the Hotel Europa and parked the car at the Doria Park Hotel. We then walked down to the dock where we purchased tickets to take the ferry to Cinque Terre. God blessed us with fantastic weather – sun, comfortable temperature, smooth waters. Our first stop was at Porta Venere, where we stopped for a one hour visit. 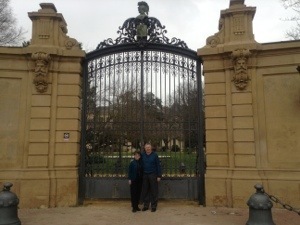 Wayne & I headed to the church at the top of the port where we viewed incredible sights. We then switched boats and resumed a glorious trip past each of the five villages of Cinque Terre, getting off at Monterosso al Mare, where Wayne & I had stayed with Randy & Melisa. This island is one of the easiest towns of the five to traverse, and we thought it would be easier for Ken and Paula to navigate. We brought them to the Belvedere Restaurant, where we had eaten before. (We had loved the linguine with basil pesto sauce and ordered it again.) The dear waitress remembered us and was happy to serve us again. Ken and Paula were content with what they had seen of the Cinque Terre. We, therefore, made the return trip by train from Monterosso al Mare to La Spezia where we transferred to a local bus that returned us to Lerici. Upon reaching the port in Lerici, we mistakenly took the longer foot path to our car. Nevertheless, we returned to retrieve our luggage and drive to Pisa where we checked in to our Monday evening lodging at Grand Hotel Bonanno and ate a light supper before retiring for the night. The Best Western in Verona provided a fabulous breakfast. How blessed we have been to stay in wonderful all-inclusive lodgings that have provided us with breakfasts featuring whole grains, fruit, protein (meat, cheese, and eggs), and expresso, cappucinos, and latte macchiato coffees! We took a pleasant drive to Lucca, a Hill Town surrounded by an imposing city wall. Lucca was the first city in Europe whose population completely embraced Christianity. We visited the cathedral of Lucca, which displayed Tintoretto’s painting of The Last Supper. Also prominently displayed was the Holy Visage, an ornate hand-carved cross crucifix. The legend of the cross stated that Nicodemus from the Holy Land constructed the cross, assisted by angels, and that, miraculously, the Holy Visage was transported to Lucca. This cross has become the symbol of the city of Lucca. In the cathedral we also viewed the funerary, financed by a wealthy gentleman to honor his wife who died while giving birth to their second child. We toured the entire cathedral complex, which included a museum that displayed large, gold-leaf embossed pages of liturgy, the gold adornments placed on the Holy Visage in the cathedral during festivals, vestments worn by the clergy, silver vessels used during the Sacrament, sculptures of Biblical personages, and an elaborate replica of the cathedral complex. We next viewed the archeological ruins beneath the cathedral dating from the second century. On display were Roman baths and the baptistery. We strolled through the historic city, admiring the architecture and other ancient sites, including the city’s functioning clock tower. Traveling on from Lucca, we drove to Lerici, a port city located on the Mediterranean Sea. We had reservations at the Doria Park Hotel, set in a lush botanical complex overlooking the port. Unfortunately, it required walking a lengthy meandering brick pathway to reach its entrance. Carrying the ten bags of luggage shared by the four of us would have been overly challenging, especially for Ken and Paula; therefore, our gracious receptionist permitted us to be moved to the Hotel Europa, also owned by the Doria Park management and located with a street level entrance at the same price and with the same amenities and also with an inspiring seaside view. Oh, how beautiful our room was with the windows opened, the birds chirping, the church bells chiming, and the wisteria fragrance floating through the air! Shortly after we got settled in our rooms and prepared to go to dinner in Lerici, a large party began to assemble in the lobby of the hotel, with party-goers struggling to find parking spaces. Unwilling to give up our convenient parking space, we opted to picnic together in our room, consuming the snack foods we had brought with us in the car. We then arranged our luggage in anticipation of the flight on Vueling Airlines on Tuesday morning, wrote our blog, and retired for the night. Tomorrow we would introduce Ken & Paula to the fantastic Cinque Terre. We awoke to a spectacular view of the Dolomites from our patio in Funes. Breakfast at the Residence Toglehof was just what I relished: grain-rich granola with nuts and fruit covered with yogurt, German-baked whole grain seeded bread with butter and jam, a soft-boiled omega-rich egg, and a latte macchiato, or cafe con leche, as it is called in Spain. What a satisfying beginning to our day! We had resolved the night before to visit the quaint, pristine church that dominated the community. What an unexpected jewel we found! Our first attention-grabber was the cemetery with its neatly tended grave sites that framed the church’s landscape. Tulip bulbs and other radiant spring flowers burst open on each of the manicured lots that had been adorned with tall metal crosses and eternal flames. It was a tremendously honoring tribute to loved ones who were buried there. A monument built to commemorate church members who had died in World Wars 1 and 2 was also included in the hallowed setting. We then opened the richly carved doors of the church to walk inside. Upon entering, we beheld a spectacle never before observed. The congregation surely had artisans in their midst who had skillfully adorned the church with hand-hewn wooden pews and other masterfully carved works of carpentry craftmanship. Everything in the church was carefully organized, seamlessly blended together in this sacred place of worship. It was obvious that the people of this congregation love their church and the God whom they adore and praise. The community of Funes is certainly a setting to which I would love to return and linger for a length of time. Wayne and I were reminded of the lovely week we had spent years earlier in Maria Ulm, Austria, in a community similar to Funes. We drove down the mountains to the fair city of Verona, the setting for Shakespeare’s tragedy, “Romeo and Juliet.” We checked in to the Best Western Hotel de Capuleti and began our walking visit of the city. We observed Verona’s Roman Arena, the third largest in Italy. built in the first century before Christ, it holds 25,000 spectators. Because a concert was being held this evening, we were unable to go inside. We walked to the Piazza del Erbe in the heart of Verona’s historic center. It is surrounded by medieval buildings with frescoes walls and towers. We proceeded on to the Church of St. Anastasia, an example of Italian Gothic architecture. It was designed by two Dominican friars who began the work of construction in 1290 AD. The impressive interior contains many frescoes and works of art. We moved on to the Duomo di Verona with frescoes from the 16th to 18th centuries. We, of course, saw Juliet’s balcony protruding from a 13th century Gothic house. We dined at an outdoor trattoria and returned to the hotel tired and eager to get a good night of sleep. Today we saw breath-taking scenes we had never seen before. After eating a deliciously healthful breakfast at Hotel Peler, we took a pleasant walk through Malcesine. We stepped inside the beautiful cathedral where we soaked in the artistic serenity of the worship setting and spent quiet moments in meditation and prayer. Departing from this sanctuary, we strolled through town, observing merchants as they prepared their places of business for a new day. It was a delightful respite before beginning our journey to Bozen/Balzano, Italy, in the Tyrolean Alps. Bozen/Balzano is a beautiful city with the unique claim to fame for having a museum devoted to the display of the “ice man,” an adventurer whose body was found near Bozen preserved in ice. Over 500 scientists have observed the “ice man” since he was found in September 1991. As we left Bozen, having programmed the Garmin to our evening’s lodging at Residence Toglhof in Funes, we followed the instructions of the Garmin as she took us high into the mountains on roads very narrow, some only one lane, but providing spectacular scenery. All throughout the mountain drive we saw grape vineyards neatly terraced in row upon row attractively carved all along the sides of the mountains. A journey that ordinarily would take thirty minutes was drawn out into 3 1/2 hours. Upon arrival at the incomparable mountainside villa, we were absolutely spell-bound by the beauty of the area. Our rooms, which offered patio seating overlooking the Dolomite mountains, were comfortable and clean. We were thrilled with the delicious meal prepared at the Viel Nois, a busy restaurant/pizzeria in the town. We retired to our amazing lodging. Wayne and I slept with the patio door open, breathing in the fresh, clean mountain air while snuggled up together in a down-filled king-sized feather bed. What a glorious day God gave us! To begin our day, our gracious hotel owner prepared a homemade, organically rich breakfast that included homemade breads, jams, eggs cooked to order, granolas, yogurt, meats and cheeses, topped off with a delicious cappuccino. We were nourished to take a gondola ride in the morning to the top of Monte Baldo where we relished a hike along the peak among the edelweiss that poked their beautiful bulbs through the tundra. We watched the hang gliders take their run, catching the wind, and ascending into the skies over Lake Garda. While sipping latte macchiatas in the outdoor restaurant, we gazed at the beauty of the mountains and the cities of Malcesine and Limone that were nestled on the mountains that rose steeply above the clear waters of Lake Garda. Today, on this Easter Monday morning, we left the Courtyard lodging at 7:25 AM in preparation for a 10:40 AM flight home on Air France. We took our luggage down the hill to the train station where we paid 23€ for the two of us for train tickets to the airport. We are thankful that we are both adventurous and healthy enough as well as driven by frugality to figure out how to use local transportation when we travel. The ride took almost an hour. When we reached the airport, we took a tram to terminal 2, where we were able to check in for our flight to Houston. All directional information was easily accessible. How truly blessed we were to be flying business class! We are enormously grateful for the business class tickets that enabled us to move swiftly through the check-in process and security as “sky priority” passengers. Even with this privilege, it took us 2 1/2 hours from the time we left our lodging to complete the check-in process and be ready for boarding. On our next international flight we will fly economy class and will not have sky priority privileges. We, therefore, placed this experience in our memory and planned to allow much more time for the check-in/security process on our next flight. We were immensely impressed with the Air France airport and our experience. We had never been in a more beautiful, sleek, modern, clean airport. It is an absolutely wonderful experience flying business class. There is ample room for seating, and the seats recline. I did not have to use my collapsible foot rest to reach flooring; the seating was ever so comfortable. For Wayne, who has varicose veins, having ample room for his legs and the ability to elevate them is ideal. Meals are served with silverware, glassware, breakable dishes, and linen napkins. It was a most pleasant experience; we are so thankful to have it. Flying the 5,238 miles direct from Paris to Houston took ten hours and eight minutes. As we flew in the air, we eagerly anticipated our reunion with our children and grandchildren. And a happy one it was! We will be home now for only two days. We have much to accomplish within these next two days, for on Thursday we leave on the next leg of our journey. We hope you will continue to follow us, as there is much more to come! After the worship service at Notre Dame concluded, we visited the Saints Chapel, built by King Louis IX in the mid-13th century in the heart of the royal palace for the purpose of housing the relics of the Passion of Christ. King Louis IX received the crown at the age of twelve and was observant of the law. Very prominent in the Crusades, King Louis IX was later named Saint Louis. His Saints Chapel displays a unique collection of fifteen stained glass windows from the 13th century that provide an exceptional example of French High Gothic architecture. We then set out on a three-mile walk along the River Seine and the Champs Élysées that encompassed the Louvres, which we had visited before, the Place of Concorde, the Gardens of Toulouse. Our eyes took in the beauty of the Arch of Triumph and the Eiffel Tower. Walking back on the other side of the river, we arrived at the subway station where we took the RER blue line that would return us to La Place. After our long walk and exhilarating day, our feet were happy the walk up the hill to our lodging at the Courtyard would be our final walk of the day. Tonight will be our last night in Paris during this leg of our journey, as tomorrow we fly home on Air France. We will be able to say that we celebrated the 850th anniversary of Notre Dame’s Easter services and thoroughly enjoyed an April day in Paris. Knowing that Carolyn Elsey, our guest, is an avid horsewoman, Wayne selected Jerez for a visit because of it rivals Vienna’s famous Spanish Riding School. 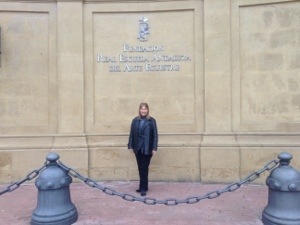 We arose for an early tour of the Andalusian School of Equestrian Art. The schooling that brings horse and rider into perfect harmony originated in Jerez. The Viennese school was started with Hispano-Arab horses sent from Jerez. We had the privilege of visiting the stables and tack room to watch the horses being trained for performances of the Dancing Horses of Jerez, which is referred to as equestrian ballet. At these performances, riders and horses perform complex choreography in perfect symmetry. We next drove to the Rock of Gibraltar, which, at 1,476 feet, “guards” the entrance from the Atlantic to the calmer beautifully blue Mediterranean Sea. Gibraltar, at only 2 1/4 square miles in size, is the smallest self-governing territory in the world, a British colony. Wayne safely navigated us in a manual standard shift rented vehicle through the narrow, steeply-inclined streets until we reached the top of “The Rock.” We had many hilarious laughs along the way while also offering many plaintive prayers(! ), especially when we had to park on sheer cliffs with no guard rails in order to view the sites. We were able to visit St. Michael’s Cave, a complex of caves filled with stalagmites and stalactites, the Great Siege Tunnels and World War II Tunnels, and the Moorish Castle and Tower of Homage from 1333. We, of course, got to see the monkeys that live on “The Rock.” It already had been quite a remarkable day, and we still had our return trip back to our little Seville apartment. We chose to take a detour from the route and visit a church on a hill in a white-washed hill town; detours can be marked by unexpected wonders. We returned to our apartment at 9:15 P.M. famished after only eating a quick pastry breakfast that lasted us through the day. It was time for tapas. Good; at this hour the kitchen would be open for service!